We spent a week up at our cabin. It was just my husband and I. Usually my sister and brother are there too. We lost my sister to cancer in February, and my brother is traveling across the U.S. in his Bluebird Wander-lodge R.V. It was hard not having them there. My sister and her hubby usually parked their toy hauler trailer next to ours and we would have coffee together every morning. August 3rd marked 6 months since she passed. My brother in law held a memorial motorcycle ride for her back in Colchester. I wish I could have been two places at once. It was a miracle I got any painting or sketching done. We’d not been up yet this year, so the first few days were spent waging war on the mice and their mess. They are disgusting, and there is just no way to keep them at bay. They will find a way in no matter what preventive measures you make. I played at doing portraits on my tablet, but I’m not really ready to share any of that yet. 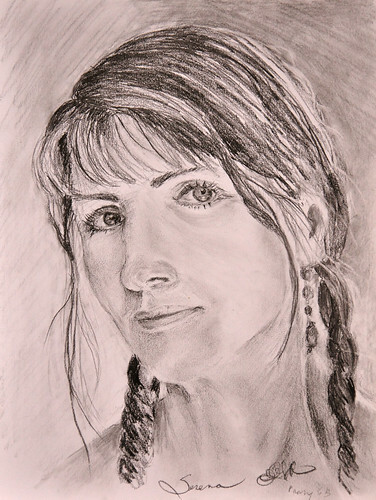 I did a pencil sketch portrait from the Julia Kay Portrait Party group. A small plein air watercolour, and an oil painting of the rifle river. So, having said that I have to say that this month got off to a rocky start with my plein air paintings. Two for the trash bin! But, I did make up for it with a couple of great portraits that are headed to the Julia Kay Portrait Party exhibition in Lapeer, Michigan. I’m also had happy with two of my plein air paintings in May. You Want a Piece of Me? Julia Kay Portrait Party, Studio 6″x6″ acrylic on canvas $125. Virtual Reflection, Julia Kay Portrait Party Studio 6″x6″ acrylic on canvas $125. As for plein air this week at Malden Park was a good painting, but I ended up getting into the ticks. I’ve got the heebee jeebies! I found two crawling on me when I got home on Monday. I thought I was clear of them when last night I reached behind my ear to feel a lump. You guessed it, a tick was imbedded behind my ear. Well… it would have been great if I’d noticed it earlier in the day, but no it was past midnight! So I called telehealth a service by the province of Ontario. The service gives you access to a nurse that will help you with making a decision on if you need to go to emergency, or if it can wait till morning. Well, unfortunately since the tick was probably in my ear for over 24 hrs it was important that I get it out asap. I didn’t trust my hubby to take it out, so off to emergency we went. Even the ER Dr was squeamish. A nurse practitioner got the lil begger out. So now Freddie the Freeloader is headed off to the public health unit to be tested for Lyme disease. Yes, I named the tick. Waiting for Spring, Reflections on River Canard River Canard Park, LaSalle, On. Plein Air Oil on 8 x 10 panel. $275. May fifth was a freezing cold day. I started dropping my brushes because my hands wouldn’t work. But the painting I did at River Canard Park I’m happy with. Serena, a photo by photographerpainterprintmaker on Flickr. Well sometimes it’s a good thing when your computer is down for a few hours. I’m glad I had my friend Serena’s photo on my tablet ready to draw last night. I need to shut the computer off more often! 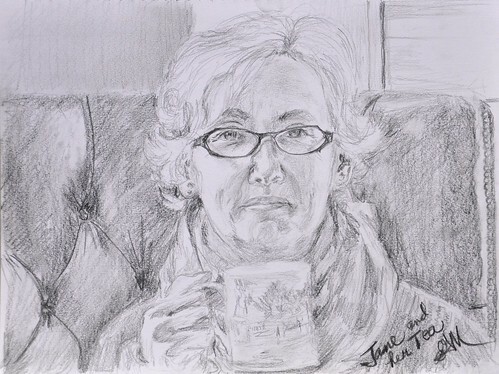 Jane and her Tea, a photo by photographerpainterprintmaker on Flickr. 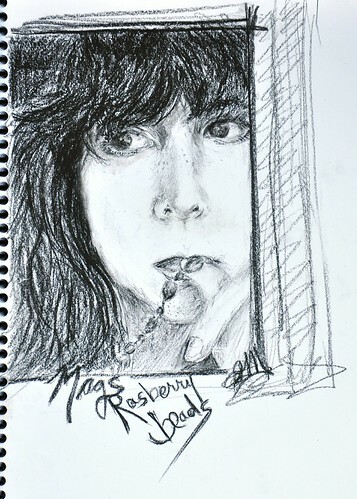 Mags Rasberry Beads, a photo by photographerpainterprintmaker on Flickr. 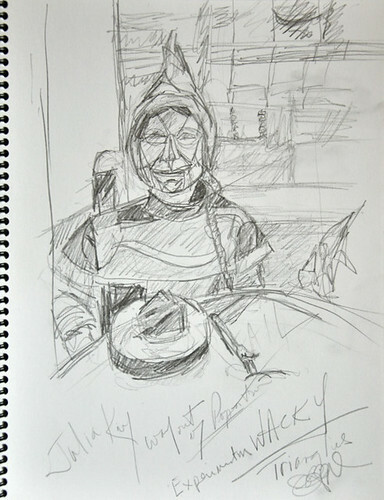 Another sketch for Julia Kay’s portrait party. I really enjoy intriguing photo’s. This great photo of Mags caught my eye. Her pensive look, as she nervously bites her beads reminded me of myself in high school. I would play with my beads nervously in English class. I Drove the teacher nuts! When they broke and spilled all over the floor she was smugly pleased. I on the other hand was embarrassed. Here is her original photo. Julia Kay founder JKPP, a photo by photographerpainterprintmaker on Flickr. So, the other day I thought I’d take a stab at sketching Julia. The drawing was not going so well, so I decided to just mess with it, and not try to be so crazy perfect. I thought it was a fail. I even wrote FAIL on it. I was not at all happy. I revisited it a few days later (something every artist should do) and the sketch had grown on me. So here she is Julia Kay, and my wacky interpretation of her colourful photo. 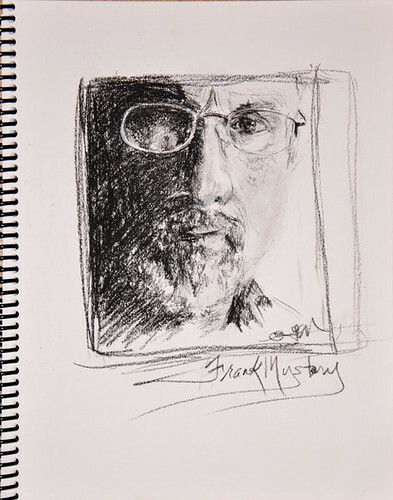 FrankMystery – JKPP, a photo by photographerpainterprintmaker on Flickr. This winter is coming to an end none too soon for me. I’ve had more than my share of sickness this winter. Maybe I’ve had too many good sick free years, and the germs decided that I’m not going to get away from them this year. Well, that has nothing to do with the image I bring you today, other than I was sick as a dog coughing up a lung when I sketched this portrait from the JKPP site on Flickr. There are over 700 artists who put their egos at risk and allow other artists to draw, paint or sketch their likeness in this great group. I was privileged to be the host of yet another successful community sketch night on February 4th, 2013. A great group of sketchers got together and spent a couple of fun filled hours sketching each other, resulting in a great mutual admiration meeting by the end of the evening. The Arts Council-Windsor Region has spearheaded a unique community sketch night. They are scheduled for every other Monday. What is unique about them is that a different organization or artist hosts each sketch night. Each organization puts its own spin on the night. Elizabeth Gaye MacDonald, President of the Windsor & Essex County Plein Air Society, will be hosting the second session of 2013 at Windsor Printmaker’s Forum. Elizabeth is inspired by the artist Julia Kay who spearheaded Julia Kay’s Portrait Party. JKPP is a communal project in which more than 700 artists from all over the world have so far made more than 30K portraits of each other in less than 3 years. It should be great fun. Bring your sketchbooks, and drawing tools. ACWR Sketch Night is made possible with the partnership of local artists Dave Kant, Christy Lister, Elizabeth MacDonald, Mary Wheeler, Windsor Printmaker’s Forum, and the Arts Council of Windsor and Region. DSC_0939 Sol complete, a photo by photographerpainterprintmaker on Flickr. Julia Kay is an amazing, and wonderful woman who’s totally obsessed with drawing a self portrait every day, even at times in her sleep! Well, maybe she’s not totally sleeping but nodding off. As I’ve said many times, Flickr is a wonderful photo sharing sight that has an incredible supportive arts community. That is where I came across Julia Kay. I’ve joined her group. The unique thing about her group is that you are not allowed to submit self portraits, instead you submit photos’ of yourself for others to draw. Julia warns everyone that if they are squeamish about the way they maybe depicted in someone’s photo it would be wise not to participate, as the diverse styles are not always flattering. Once I submitted my photo it didn’t take long for people to start drawing and painting away on traditionals and digital media. I am inspired by all the different ways of seeing this group expresses. 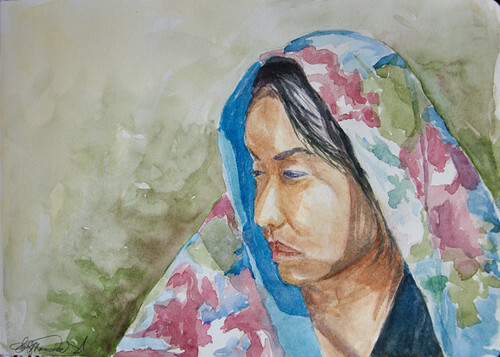 I encourage you to have a look at the group, and especially at Julia Kay’s work. As for me, well I may not get a portrait a day in, but I will accomplish something and more than if I’d not joined at all. Oh, and I’ve not drawn or painted many portraits so I’ve a lot to learn in the process. It’s too cold to paint outdoors so this group will keep me from getting rusty over the winter. Have a look at Julia’s selected sets from her Daily Portrait Project, in which she’s been making an image of herself every day since 3/15/2007.